(SitNews) Ketchikan, Alaska - Once upon a time we didn’t worry much about upcoming weather. Sure, we would get a little concerned it the skies darkened when we were traveling on the water and we certainly looked askance at rising winds if we had a plane flight coming up but in general the weather just sort of happened and we dealt with it. We used to always kind of chuckle when we saw TV news reports of hurricanes down south and all the folks running around nailing up plywood and stripping the grocery store shelves bare of necessities. 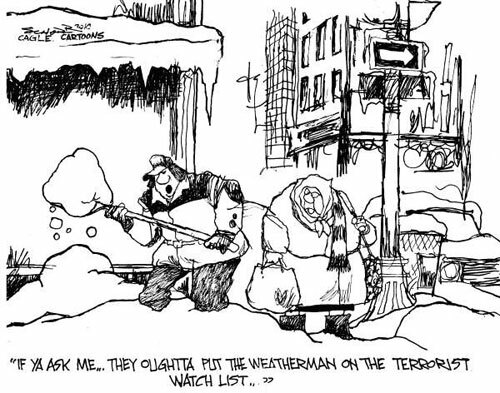 Distributed to subscribers by Cagle Cartoons, Inc.
Sure, we had storms. We had occasional blizzards, random hurricanes, torrential downpours that would have drowned half the Lower 48. But there wasn’t much point in getting ready for them because we didn’t usually know what was coming. And so it was the case a couple of weeks ago when Ketchikan residents prepared for the “storm of the century” to bury us in somewhere around three feet of snow. Okay, so the “century” is only a decade old, but you get the idea. Everything that occurs to us now has to be described in just short of apocalyptic terms otherwise it gets lost in all the other informational flotsam and jetsam that pixels its way into our brains every nano-second. Then the warnings became a little more dire. “A very slow moving storm that could spend up to three days” hovering over K-town and dumping anywhere from 6 to 12 to 18 to 36 inches of snow on the First City. Of course, I can hear my friends in Valdez snickering because in those parts 36 inches is an average daily accumulation. Still, we don’t get that much snow down here in the Banana Belt and we have all these goll darn hills to deal with. So in Ketchikan, snow is big thing. (Not mention all the sledding opportunities it provides to my offspring). Anyway, local tongues started to chatter, days before the storm arrival. Natch, in Ketchikan, we like to talk about the weather and this gave the rare opportunity to look ahead to something that could be spectacular (don’t forget to check on your boats!). Anyway, the week moved on and the weather reports just kept getting gloomier. Some folks even looked at the satellite pics on the computer and, yes indeed, there was a big ugly white mass of clouds out in the North Pacific bearing down on Southeast. And it was moving really slowly so it could hang out and deluge Ketchikan in more snow than we’ve seen since we were kids and we had to walk 10 miles to school in the snow, both ways, uphill. Finally – on Friday – D-day arrived. Just not yet in Ketchikan. It was cold and drizzly but not storming. Noon passed and it got a little slushier. Still there was plenty of time because the storm was supposed begin any minute and last until Sunday morning. The anticipation was killing us. Finally late Friday afternoon, it started to snow. Here it comes! Sort of. Only about an inch or so of snow fell. So we had to dig out our driveways. Then it started snowing again just after dark. Here came the deluge. There was only a couple of inches on the ground by Saturday morning. So a little more digging out of the driveways and more waiting for the big storm. Better get some more rock salt. Noon – Saturday, here come the big flakes! Another inch or so to dig out. Better head to the store one last time. 5 pm. Getting dark. A few more flurries. The storm better hurry if it wants to get here by Sunday morning. Sunday morning – Storm warning over.